Good news regarding my Erzulie Dantor painting fresh from my easel: my dear Erzulie Dantor after small skin and lips correction looks much better. But I realized yesterday that I have done a mistake while painting. I painted three silver rings on her finger. After internet recherche I found out that three silver rings are attributes of Erzulie Freda, the sister of Erzulie, and NOT Erzulie Dantor. What should I do with it? Is this a big mistake? Can Ezili live with three rings? What do you mean? 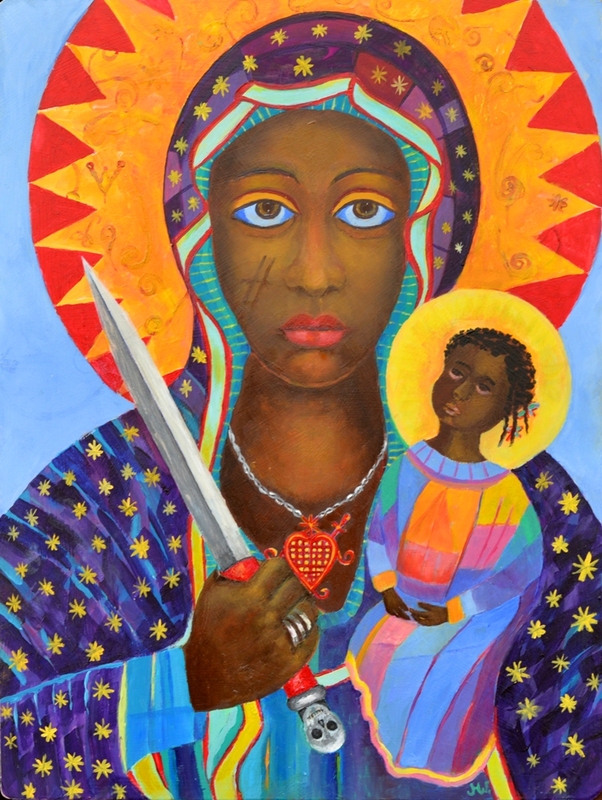 The good news: the original painting of Erzulie is in my small shop on this site available: Voodoo art – Erzulie Dantor. Canvas prints of the original painting in my Etsy shop: Erzulie Dantor canvas print. And on my easel there is a new painting just started yesterday: Erzulie Freda portrait. Work in progress.